My first post here and apologize for being naive, just approaching texturing even if I'll purchase the Pro for experimenting with PBR. 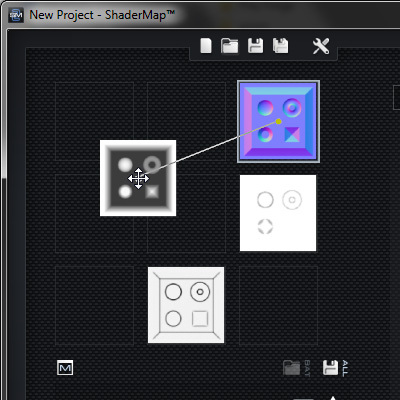 Creating maps for different programs such as Unreal and Unigine they require different packed maps. As beginner I find difficult do understand what are the maps I'm working on since there is no label idefiying it them in the map matrix of the main windows, and also not when I assign to the different channel R, G, B, A so that I need always to switch screen to check what I'm assigning to what channel. Would suggest in one of the next releases to make some space in the UI for a label, or insert it as overlay when the mouse is over the map. Welcome to the ShaderMap support forums. For the moment, you can identify an individual map by clicking on it, at the top of the map properties (below the project grid) you will see the name of the map / node. I like your suggestion to display channels embedded in a particular map on mouse over. I'll add that to the list, it should be simple to implement. I'll also add an option to disable the tool-tip popup, if it isn't desired by the user. where a label or mouse over will be useful. Even more clear in my opinion if the name will be shown directly in a corner or something like that. for some reason the mouse over didn't show always the map name, it shows me for a saved project but not for another new one. Maybe I miss come configuration. Thanks for your additional input. 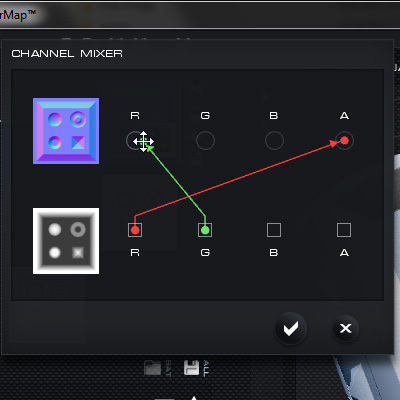 Identifying the maps in the Chanel Mixer is a good idea. As far as the mouse over tool-tip popup... you might have found a bug. For some reason the maps aren't always displaying their name when they should be.